While we all wait excitedly to see if the Denver alien video will sway UFO-doubting voters to vote for Jeff Peckman's ballot measure to create an Extraterrestrial Affairs Commission in Denver, let's take a moment to remember the greatest UFO believers of all time, the members of the ill-fated Heaven's Gate religion. Sure there are more famous alien-worshiping groups like the Scientologists, and more classic space-brother-seeking types like members of the half-century-old Aetherius Society (who believe they've been contacted by members of an "Interplanetary Parliament"). 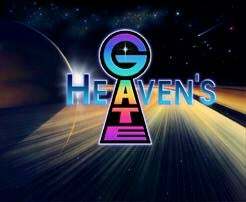 But the members of Heaven's Gate had a few things none of these other religions had that made them hands-down the best. First of all, the members of Heaven's Gate were web designers (check out their amazing Web 1.0 designs here), which automatically makes them twenty million times more likely to meet aliens, since we all know aliens live in cyberspace. And they also watched Star Trek religiously, gathering together on the nights it aired and sitting in perfect rows to take in the next installment in the show that apparently confirmed their belief in aliens riding behind the Hale-Bopp comet who would save them. Though the Heaven's Gate religion had once had thousands of members back in the 1960s and 70s, by the late 1990s it had dwindled to just a couple of dozen. Sadly, they took their beliefs way too seriously. Several of the men in the group voluntarily castrated themselves in order to maintain their monastic lifestyle. And then the group began careening towards suicide. Believing they needed to leave their human bodies to become one with the Hale-Bopp aliens, they took poison together in 1997 and died in their palatial San Diego mansion where their website building business was located. Though their deaths were incredibly sad, it's clear they died believing they would be going to a better world. And they never tried to force anyone else to go with them the way the Scientologists do.